Apple Macbook Pro Rumers with macOS High Sierra Operating System, 6-core Intel Core i7 8th Generation Processor ticking at up to 2.6 GHz with Turbo Boost up to 4.3 GHz clock Rate, 16GB 2400MHz DDR4 Memory Upto 256GB/512GB PCIe-based SSD Solid State Drive internal storage. 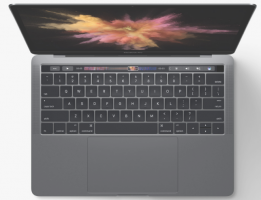 Apple Macbook Pro also has DTS Sound,Integrated stereo speakers, Apple True Vision web cam, Microphone, 64 (U.S.) or 65 (ISO) keys including 4 arrow keys Touch Bar with integrated Touch ID sensor Ambient light sensor. The Laptop has 16.0 inch screen size, Height: 0.61 inch (1.55 cm) x Width: 13.75 inches (34.93 cm) x Depth: 9.48 inches (24.07 cm) Physical Dimension and 4.02 pounds (1.83 kg) weight and 87W USB-C Power Adapter, Line voltage: 100V to 240V AC Frequency: 50Hz to 60Hz, Built-in 83.6-watt-hour lithium-polymer battery with Up to 10 hours wireless web Up to 10 hours iTunes movie playback Up to 30 days of standby battery Time. The Apple Macbook Pro Laptop will start Expected Price 2399$ in USA when it launches within the Few Weaks 2019.